Some things are not always what they appear to be! The first one1 is the remains of a swimming reptile, an Ichthyosaurus, in the National Museum of Wales in Cardiff in the United Kingdom. This fossil has been on display for over a century and has been viewed by thousands, if not millions, of visitors to that museum. Last autumn, it was decided to clean the specimen, and when the technicians started to do so, they found that some of the bones were made of plaster of Paris that had been covered by five layers of paint in order to make them look like fossil bones! Furthermore, this particular fossil Ichthyosaurus was in fact made up from two different specimens! As Dr Caroline Buttler, the museum conservator, said: ‘It was an amalgam of two different types of ichthyosaurus plus a clever attempt at fake parts.’ The museum plans to put the Ichthyosaurus back on display as an example of Victorian forgery. How many other forgeries are on display in the natural history museums around the world? The other fossil that is not all that it appears to be is the famous Triceratops dinosaur (or ‘Mr T’, as he is affectionately known) on display in the National Museum of Natural History, Smithsonian Institution in the USA. In a recent report2 in National Geographic, it was revealed that this specimen was assembled in 1905 from the bones of 14 different animals! Furthermore, his feet are from a totally different dinosaur–a duck billed one! Again, the question must be put: how many other fossils on display in our museums are the result of the assemblage of many different animals? One thing these reports teach us is that we should be wary of what we see in museums and not accept what we are told as necessarily being the truth–we might be looking at yet another fraudulent attempt to provide ‘evidence’ in support of the theory of evolution. Although these two fossil reconstructions were probably not intended to deceive in the manner of the Archaeoraptor (‘dino-bird’) and Piltdown Man forgeries (and let’s not forget Haeckel’s fraudulent embryo drawings), two points can be made. These examples also show how fossil reconstructions are continually being remodelled or abandoned, as new information comes to light.3,4 They highlight the uncertainty surrounding claims about past appearance, diet, etc., based on little more than present skeletal evidence. Consequently, let us base all our thinking on a reliable eyewitness account (God’s Word) of what really happened in the past. Animals (including dinosaurs) were created to reproduce after their own kind–no evolution has taken place. As for the fossils, they bear mute testimony to having been rapidly buried in a watery event of global proportions, just as the Bible tells us happened in Noah’s day. Electronic The Daily Telegraph, London, Issue no. 2023, Friday 8 December 2000. Return to text. Report in Geographica section, ‘New and Improved’ National Geographic 198(6), December 2000. Return to text. For example, traditional towering images of huge long-necked dinosaurs like Diplodocus are now thought to be wrong. Instead it is now believed they held their neck in a horizontal or ‘head-down’ grazing position. 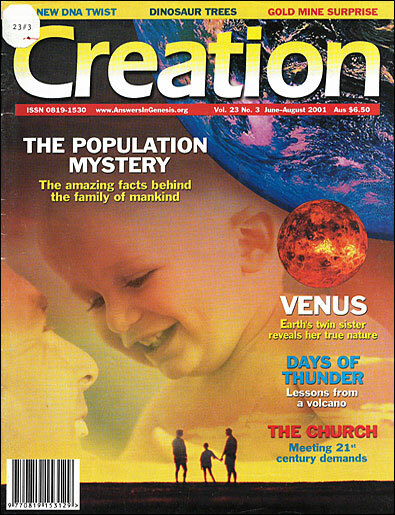 Creation 21(4):8, 1999. Return to text. Ideas have also been revised about the feeding habits of the dinosaur Allosaurus, as it apparently has a much stronger skull than first thought. Erickson, G.M., The bite of Allosaurus, Nature 409(6823):987—988, 2001. Return to text. While taking an honours degree in Chemistry, Dr White studied Geology up to pass degree level. He is now the CEO of Answers in Genesis (UK), headquartered in Leicester.